Aidan Storm is part of a unique New Orleans family whose magical connection with the weather goes back many years. Aidan uses his powers only when it suits his purposes. Wielding the magic of summer heat can be advantageous when heating up the sheets with his latest girl-du-jour. Until he meets Melissa Cross. She fires him up hotter than a Louisiana heat wave and if he doesn’t watch his heart he might suffer a meltdown. Melissa Cross is a staid Bostonian feeling like a fish out of water working alongside Aidan Storm and his peculiar family. When strange things start happening whenever she’s with Aidan, she wonders what kind of magic he possesses. After all, it isn’t every day it rains in the bedroom! 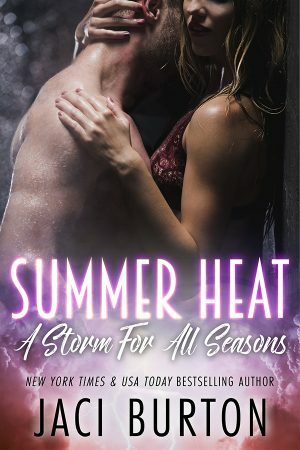 It isn’t long before Aidan heats up Melissa’s summer and melts her frosty heart.